You have to make these crazy-easy, loaded potato bundles on the grill this summer. Find three ways to transform a potato into a new family-favorite below. Thanks to Crystal Farms® for inspiring today’s post. 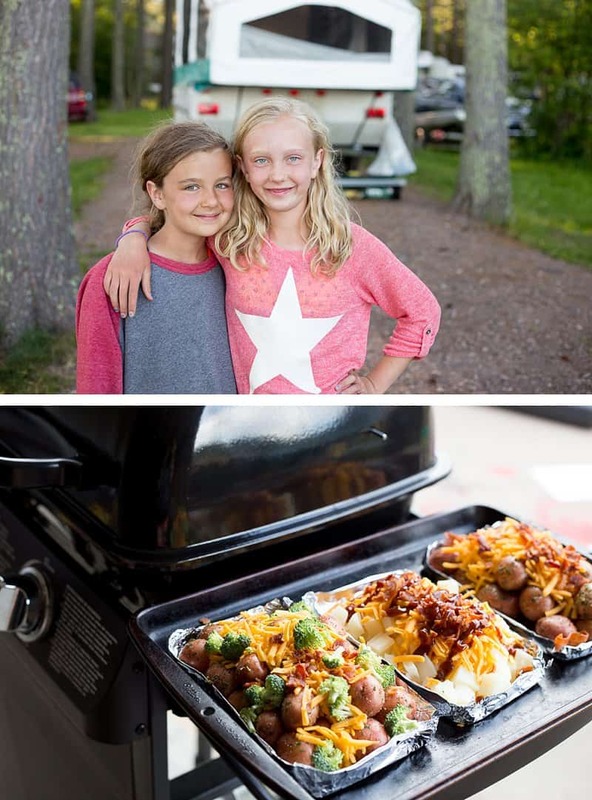 When you’re camping, there’s something about dinnertime that’s absolutely blissful. Perhaps making dinner is more relaxing and fun because your day-to-day worries have been left at home. Or maybe it’s the smell of the campfire and the sound of the trees rustling in the wind that add to the enjoyment. In any case, when camping, the food at dinner is always amazing… Each morsel is such a treat! I swear that being outside all day makes you positively ravenous at suppertime. My personal camping favorite? Loaded potato bundles. 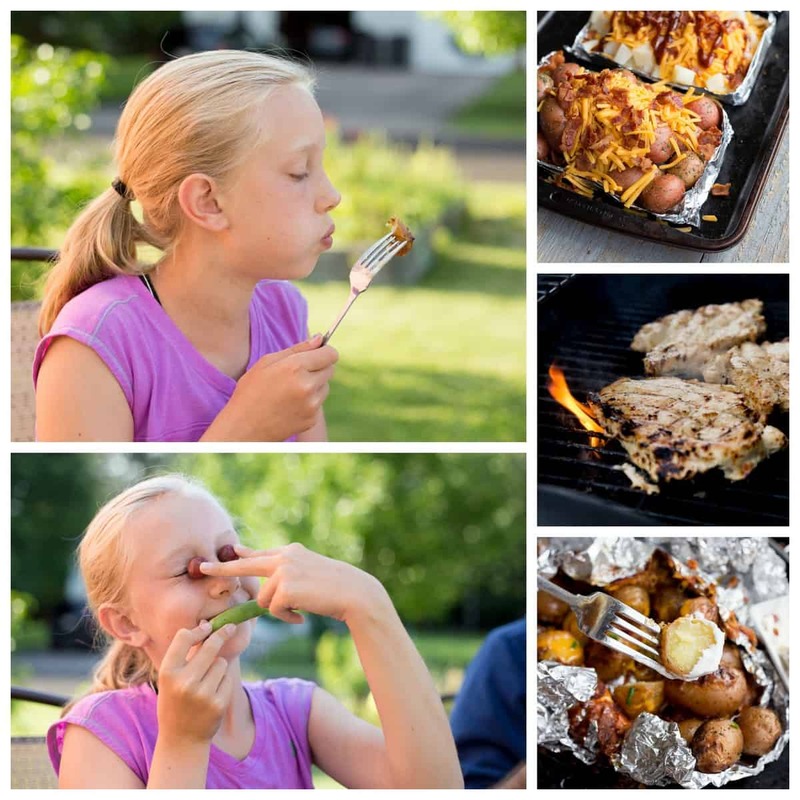 Growing up, when my parents took us camping, we made the straight-up, classic potato-and-butter foil packets on the grill. This is a tradition I’ve carried on with my own children, but we’ve improvised on the idea a bit. These revised loaded potato bundles are so delicious and easy. You simply have to make them this summer. Whether you’re camping, hosting a BBQ, or just looking for a quick family dinner… you should definitely be grilling (and loading up!) your potatoes. Cheesy Broccoli and Potato Packets—Foil-wrapped new potatoes garnished with fresh chopped broccoli, sharp cheddar cheese, and bacon bits. Bacon Cheddar Potato Bundles—Chopped red potatoes topped with pepper, spicy BBQ sauce, a mound of shredded cheese, and bacon. Sharp-Cheddar Loaded Potato Packets—New potatoes covered in seasoned salt, melted butter, sharp cheddar cheese, and fresh bacon crumbles, served with a side of sour cream. Are you noticing a theme here? Can you guess the secret ingredient? I often joke with my girls that I need to “test” the bacon and freshly grated cheese before I add it to the recipe. My kids (and husband!) also frequently volunteer to “sample” the Crystal Farms® Sharp Cheddar for these loaded potato bundle recipes too, in the end forcing me to grate more. The most important thing to think about when making potato bundles is SIZE. 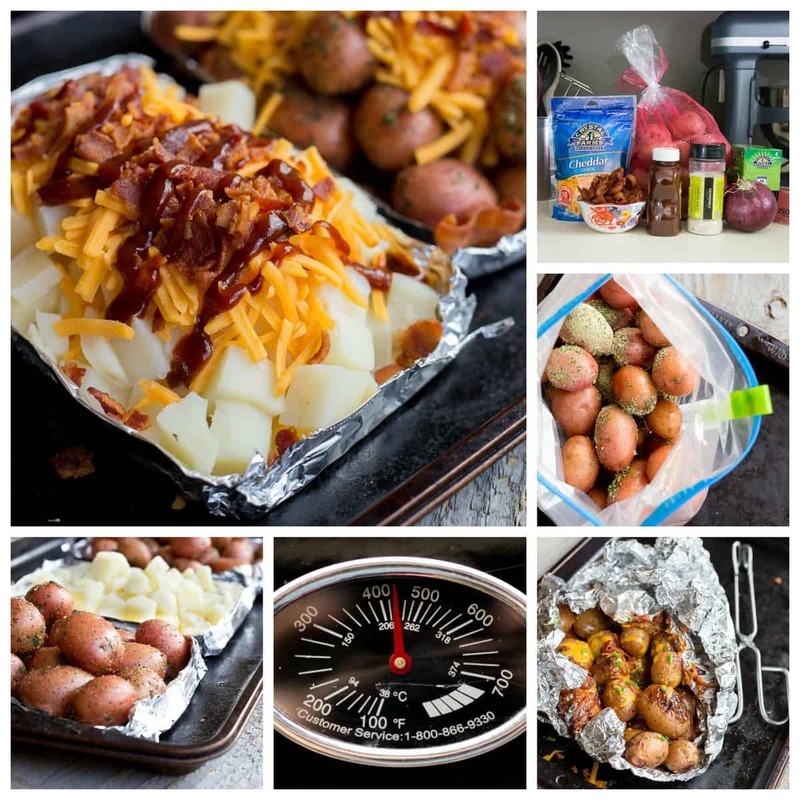 Your grilling time will vary based on how big your potato pieces are and how many are in your foil packet. If you’re making potato bundles as a side dish, you’ll want to try to coordinate your cook time with your main entree. So, for example, if you’re grilling boneless chicken breasts, you’d want to keep your diced potatoes and foil packets small to ensure your cooking time remains reasonable. If you’re making something like a pork tenderloin or bone-in chicken, make your potato bundles slightly larger. The process for all three potato bundle recipes is fairly similar. After potatoes are washed and cut, combine the seasonings. In a sealed plastic bag, toss potatoes, seasoning, and melted butter. Spray the center of each heavy-duty foil strip with non-stick spray. 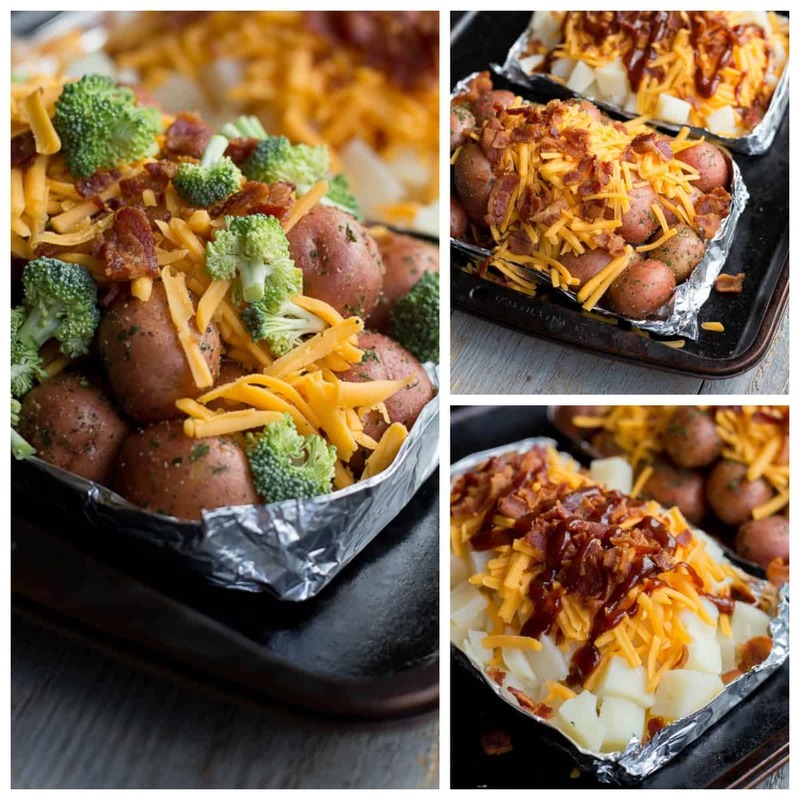 Spoon potatoes into individual aluminum foil squares and add favorite toppers. Wrap potatoes completely in foil so they are completely covered. Do not compress the packet too much; there needs to be some room for steam to circulate. Grill on medium heat, bake at 425 degrees, or cook in a fire pit for 20-30 minutes until potatoes are tender and break apart easily. The time will vary based on how big your potato pieces are and how many are in your foil packet. Remove from grill, open carefully (be cautious of the steam), and serve immediately. RECOMMENDED TOPPINGS: Bacon, bacon, and more bacon. Broccoli, onions, sausage, ham, kielbasa, peppers, ranch, BBQ sauce... The sky's the limit! Foil-wrapped new potatoes, fresh chopped broccoli bites, sharp cheddar cheese, a dash of garlic and bacon bits. Chopped red potatoes topped with pepper, spicy BBQ sauce, a mound of shredded cheese, and bacon. New potatoes covered in seasoned salt, melted butter, sharp cheddar cheese, and fresh bacon crumbles. These are best served with a side of sour cream topped with fresh chives. Yep, you might have guessed it. Even though we continue to experiment with new foil-wrapped potato bundles, my daughter still loves the Sharp-Cheddar Loaded Potato Packets the best. Loaded potato bundles are a perfect grilling side, but honestly… sometimes we eat them as our main entree with a variety of fresh fruits and veggies on the side. Skip the dicing. Either get “new potatoes,” which are just super-small potatoes or buy pre-diced potatoes. We also love Simply Potatoes, the green bag in the fridge aisle, because they’re the perfect-sized potato piece (and because the potatoes have never been frozen). Check out our family’s favorite potato pancake recipe using Simply Potatoes here: Must-Try Latke Recipe. Can you tell I love potatoes?!? Skip the shredding. Save time by buying pre-shredded cheese. Another perk of shredded cheese is all the pre-mixed varieties available. The next time I make potato bundles, I want to try Crystal Farms® Shredded 3 Pepper Cheese. It’s a zesty blend of cheddar cheese with chipotle peppers, Monterrey Jack cheese with habanero peppers and Monterrey Jack cheese with jalapeño peppers. Olé! Skip baking the bacon. You know I’m obsessed with getting bacon perfect every time. But sometimes you’ve got to skip frying or baking the bacon and grab the pre-cooked varieties. A heads-up, you get what you pay for when it comes to pre-made bacon. Stay out of the interior isles and check out the refrigerated section of your grocery store. Skip the mega foil packet with giant potato wedges. Again, your grilling or baking time will vary based on how big your potato pieces are and how many are in your foil packet. If you’re in a hurry, keep your potato pieces and bundle small. I can’t help but eat my cheesy potatoes and smile. I’d love to hear about your favorite potato bundle combinations. Let’s chat on Facebook or in the comments below. P.S. What I love about Crystal Farms® products is that they are made BY cheese lovers FOR cheese lovers. Disclosure of Material Connection: This is a “sponsored post.” The company who sponsored it compensated me via a cash payment, gift, or something else of value to write it. Regardless, I only recommend products or services I use personally and believe will be good for my readers. 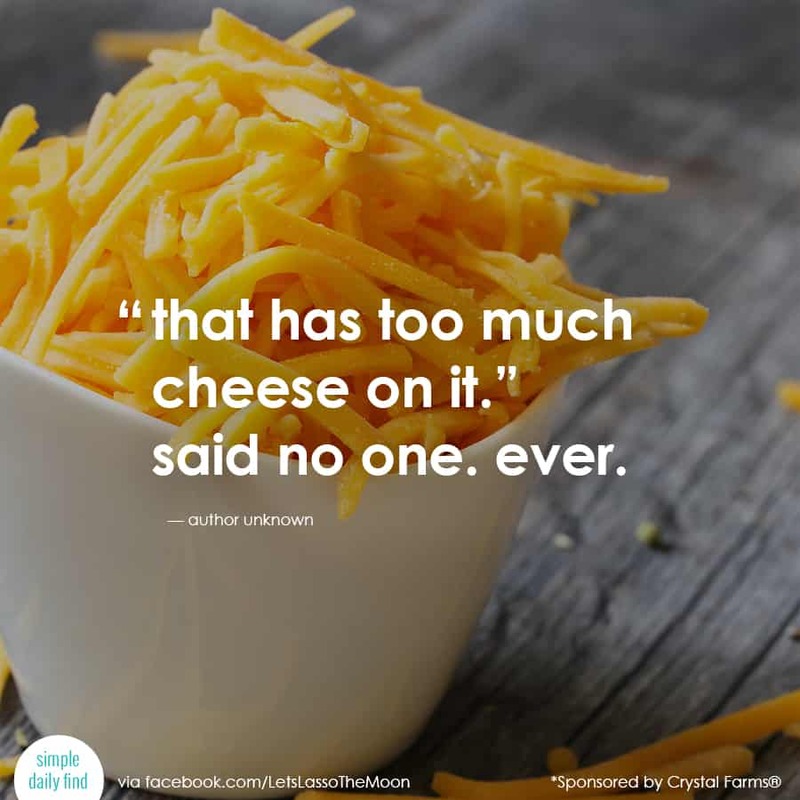 I am disclosing this in accordance with the Federal Trade Commission’s 16 CFR, Part 255: “Guides Concerning the Use of Endorsements and Testimonials in Advertising.” This is a sponsored conversation written by me on behalf of Crystal Farms® Cheese. The opinions and text are all mine. 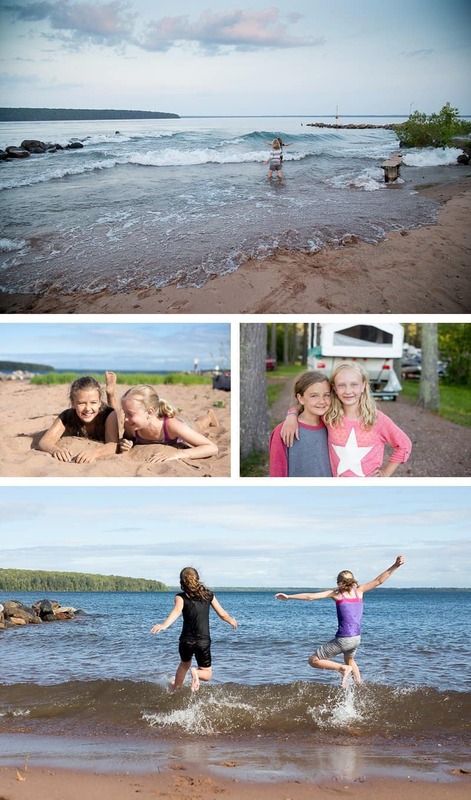 « The Worst Mistake You Can Make When Hiking With Your Kids — Do You Do This? I am sorry to the huge review, yet Now i’m truly caring the modern Microsoft zune, and also desire this kind of, and also the exceptional temistonials a few other people have written, can help you determine if it is the answer you’re looking for.